Another concentration of cases: The worries about Ewing and other forms of childhood cancer go well beyond the Canon-McMillan School District. 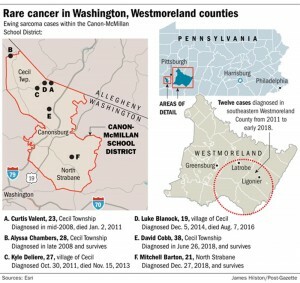 In Westmoreland County, 12 cases of Ewing sarcoma were found to be diagnosed from 2011 through early 2018. Maureen Grace, a Westmoreland County lawyer and teacher, began compiling a list upon hearing of one case after another in areas southeast of Greensburg. “All that I can say is that I saw beautiful children and families suffering. I asked myself, ‘What if this happened to a child in my family?’ Every child, every parent and anyone who cares about children has the right to clean, healthy, safe air, water and surroundings for their babies, little ones and teenagers to grow and become adults. I don’t know if we have this environment right now,” Ms. Grace said. So determined, she sought help from two St. Vincent College researchers — Elaine Bennett, professor of anthropology and public health, and Cynthia Walter, a now-retired professor of ecology and toxicology — who recruited students to help verify cases, analyze results and write a report. Ms. Grace also received help through the Healthy Child/Healthy World Organization. 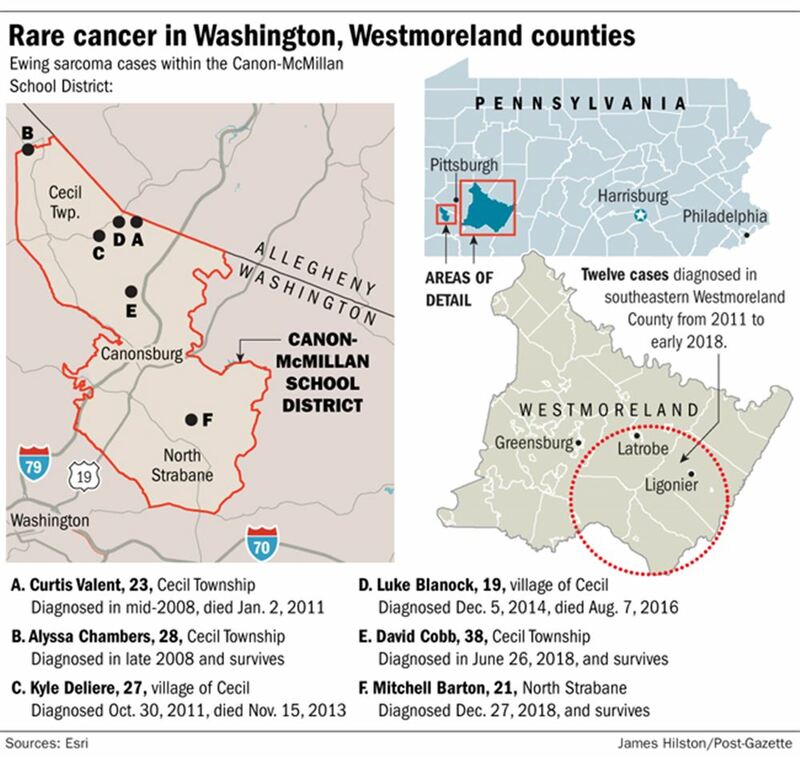 The research team, known as the Westmoreland County Pa. Ewing Sarcoma Project, submitted its report to the state health department and CDC in December 2017. Working quietly, Ms. Grace finally responded to longstanding inquiries from the Pittsburgh Post-Gazette and stepped forward with Ms. Walter, who holds a doctorate in biology, to publicize their results. Ms. Grace said she initially documented eight pediatric Ewing cases and the health department now has expanded that total to 12, when cases involving young adults were included. Confirming a cluster requires meeting a high statistical and analytical bar, including identifying a pollution or chemical exposure linked to that cancer, according to a Pitt biostatistician. 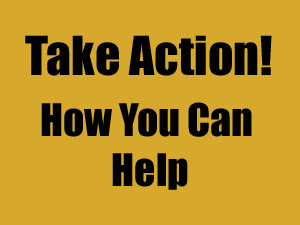 That presents a problem because Ewing sarcoma has no known cause. What could be the cause? From “Ewing Sarcoma” in Wikipedia …..
Reference 38. “Three Wake students battle rare cancer: Cluster or coincidence?”. WRAL.com. 29 April 2013. Archived from the original on 2013-05-01. Retrieved 2013-04-30.